Dr. Anita DeFoe’s latest book is a treasure chest full of insights on key principles of effective leadership. Within these pages, you will find an unlimited amount of wisdom and guidance whether you are at the beginning stages of becoming a leader or you are seeking information to become a better leader. The ideas presented in this book are simple, clear, and easy to grasp…yet profound. This book is definitely a guide for helping women to unleash their leadership greatness from within. What a tragedy to go throughout life never realizing the greatness that was within you. Sadly, so many women take their greatness to their grave without ever tapping into it. Dr. DeFoe understands what it takes to be a leader. So often we view leadership based upon a person’s job title or position, which is far from the truth. To survive in the years to come, successful organizations-in business, in government, in the nonprofit world-will have to undergo a profound culture change. Their people will have to think quicker, work smarter, dream wilder, and relate to each other in very different ways. Most important of all, this cultural change will require a whole new breed of leader, a leader unlike the bosses most of us have worked for and some of us perhaps have become. The day has long since passed when a company can be run with a bullwhip and a chair. The leaders of tomorrow will have to establish a real vision and a sense of values for the organizations they wish to lead. These leaders will have to communicate and motivate far more effectively than leaders of the past. It’s very difficult to motivate and communicate if you have not been guided properly. The timing of this book is perfect with the collapsing of the auto industry, a failing economy and countless people who are facing job loss daily. In times like these, we need leaders to emerge. Dr. DeFoe’s life is a living testimony on what she is writing about, as she left a secure, cushy, high salaried job to follow her passion which is providing training to help women tap into their greatness, so the messenger is the message. That is leadership and greatness at its best. Story telling has been an integral part of black history for centuries, used to pass down long held traditions and customs, but equally important to teach. We can all remember some story told to us by parents and grandparents to reinforce a particular life lesson. The story made it very simple and effective, allowing for rapid and retentive learning. I would dare say that we learn and retain far more from stories than from actual textbook and traditional teaching. Anita Davis-DeFoe has tapped into this rich tradition allowing readers of Follow Her Lead, to quickly grasp and understand the nuances and intricacies of leadership and how self empowerment is a simple act requiring very little external influences as it draws on the latent power we all have inside. This is a great piece of work and should be a template for learning from primary into business schools for men and women. Once again, Dr. Davis-DeFoe amazes me with her freshness and innovative thinking. The material in her book will serve as a blueprint not only for women in leadership roles, but also can serve to assist open-minded men in similar roles. Follow Her Lead is a book that every woman should add to her personal library. Dr. DeFoe uses entertaining narratives and stories to help America’s young women realize the innate gifts they hold within to help them achieve anything they desire. The guideposts, exercises, and affirmations at the end of each chapter are not only enlightening and helpful. They are life lessons that will never grow old. Congratulations to Dr. Anita Davis-DeFoe on her amazing work in this great book. This book is just what women need worldwide to assist them in capturing their dreams of becoming great leaders of today and tomorrow. 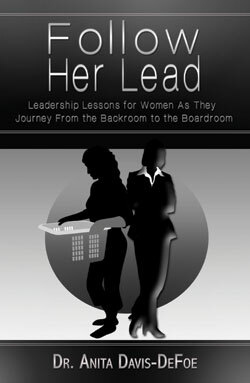 Follow Her Lead is a great template for all women; women who are becoming leaders, as well as those you are already leaders. Thank you for showing us the way. Dr. Davis-Defoe’s story writing prowess coupled with experience and knowledge in the area of human interaction makes for a great story cleverly told from an angle of friendship, conflicts, and colorful characters with messages deep to their core. This booked is filled with wonderful little anecdotes for every day living life on purpose, as well as it is broken into simple lessons and real examples for success that can be achieved without much effort. It makes you not want to put the book down until you have supped the last drop and relearned what to do to achieve your potential. A thoroughly enjoying read right until the finish; and then some.